The Denbigh pedestrian gate is the most economical of our pedestrian gates, but that is not to say say we skimp on quality or any other aspect of the gate! 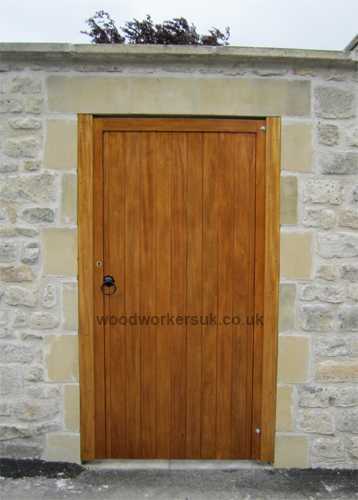 The Denbigh is also available as a flat top gate click here to scroll down. 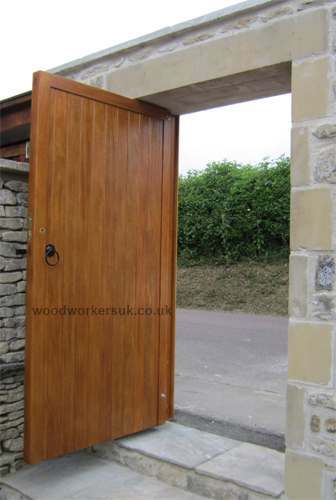 It’s made to the same high standards as the rest of our gates whether you opt for the Softwood version or European Oak gate – it doesn’t matter to us, what matters is that we make you a gate to last! Fancy a variation? 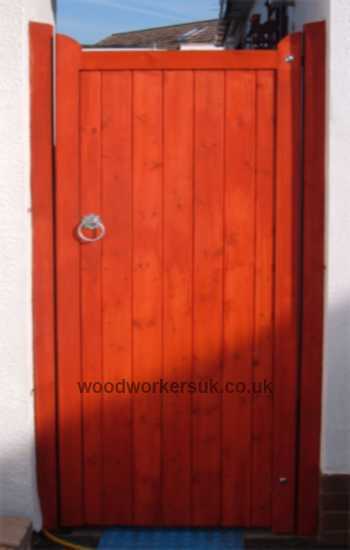 As well as the close boarded version of the gate, an open boarded version (below Idigbo, hardwood) is also available. Again, this can be made specifically for your opening sizes and will be made entirely for you and your home. 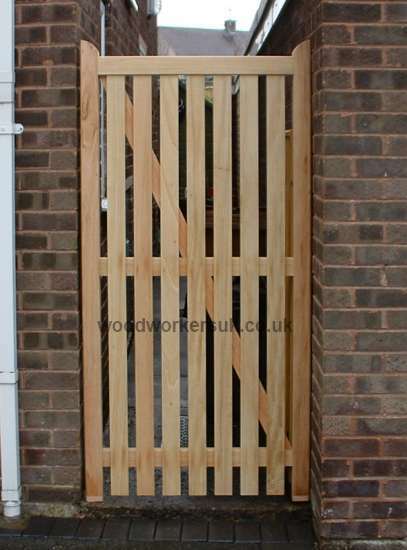 Denbigh pedestrian gate in Scandinavian Redwood. Click for a larger picture. Rear view of a fully boarded Denbigh gate. Click to enlarge. Want a flat top pedestrian gate to fit an enclosed opening? The Denbigh pedestrian gate can also be manufactured with a flat top to allow installation within an enclosed stone or brickwork opening.The Denbigh can be fitted within the opening the traditional way with two posts or we can manufacture a matching frame (without a cill) to match. All we need to know is whether you require posts or a frame and be sure to let us know that it is being fitted within an enclosed opening so we can allow the required clearances for you. 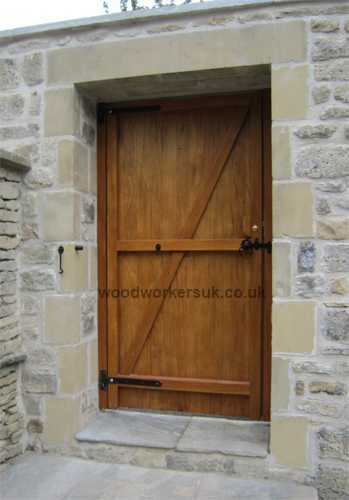 Looking for an arched or curved gate to fit within an enclosed brickwork opening? If so then check out the sub section on our semi circular arched gates page for more information! All top edges on any horizontal rails of the Denbigh gate feature an angled water run off, this stops the build up of moisture on your gates and makes for a longer lifespan. 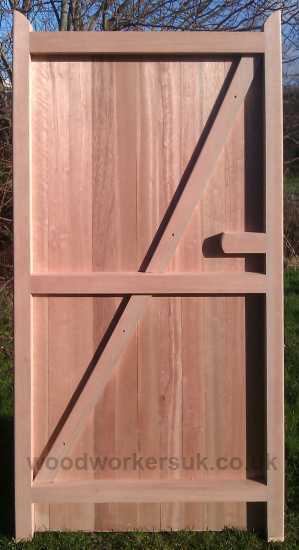 The stiles of our Denbigh gate (vertical outer uprights of the gate frame) also have rounded outer edges. The Denbigh guide prices are based on a single gate 6ft high x 3ft overall wide (approx 1830mm high x 915mm wide), these are NOT from prices, smaller gates will be more economical etc – contact us for a price! All prices are correct time of insertion and are EX VAT. Free delivery to most parts of the UK mainland is included – exclusions do apply, again please contact us. To get a personalised costing on our Denbigh pedestrian gates please use the form below. Our gates like to know where they will be going! Please leave us your Postcode or County if delivery is required.